Socka Waveboard Color 277, Orange. Self patterning 4 ply sock yarn producing waves of black on an orange background. Machine washable. 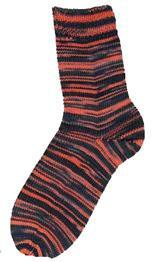 75% virgin wool and 25% polyamide (nylon). 100g, 420mtrs.